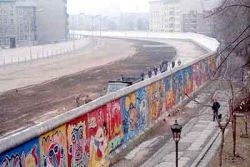 Berlin Wall History is a topic which fascinates and enthralls people all over the world. 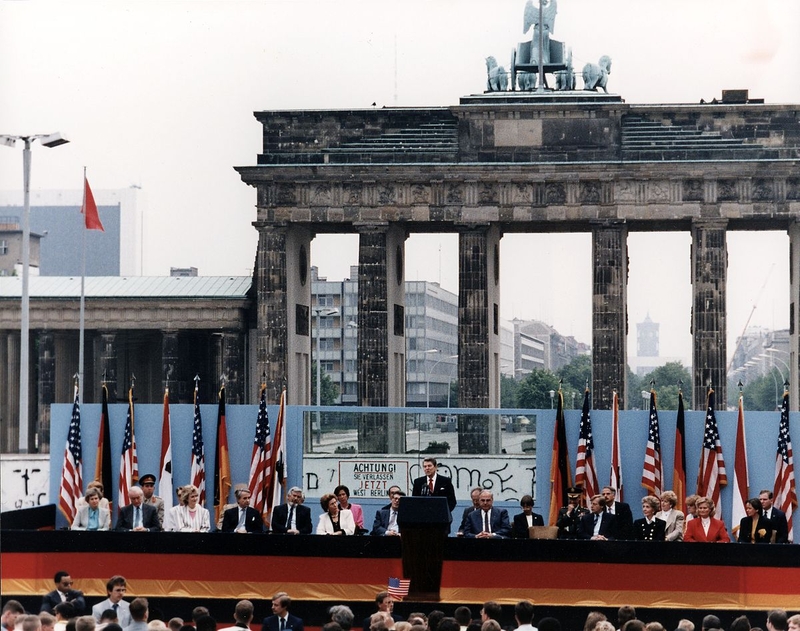 Perhaps the most common symbol of the Cold War, The Berlin Wall together with the border between East and West Germany were referred to collectively as the Iron Curtain. The Berlin Wall stood from 1961 until 1989, dividing a city, separating families, friends and loved ones. After German re-unification the Wall was dismantled and removed in 1990 and now can only be experienced in a few sites around Berlin where parts have been left as memorials. To make a very complex topic a bit easier to digest we have distilled the history into a timeline of the key historical events leading up to the construction of the Berlin Wall as well as what led to its destruction. For information on the remaining sections of the Berlin wall, and where to best experience and learn about it when you are visiting Berlin, read our article on the Top 10 Berlin Wall Locations. We also have a more specific account of When was the Berlin Wall Built. 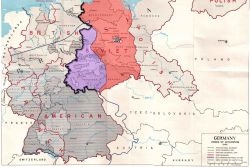 1945 At the end of the Second World War, war-ravaged Germany is divided into 4 zones administered by the victorious allies, The USSR, USA, UK and France. 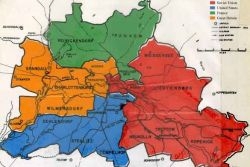 Although located in the Soviet sector, Berlin, the capital, is also similarly divided between the allies, creating an island of western capitalism in a sea of Soviet-controlled Communist East Germany. 24th June 1948 The Soviets put pressure on the Western Allies by blocking road access to West Berlin, forcing the largest airlift in history to supply West Berlin with essential items for the nearly 11 months that the Berlin Blockade lasted. 1950 The border between East Germany (the German Democratic Republic, or GDR) and West Germany (the Federal Republic of Germany or FRG) is essentially open and can be easily crossed in a number of places. This provides various options for citizens of the GDR wishing to defect to the west. 1952 East German leaders together with Soviet leader Joseph Stalin decided that the border between East and West should be closed and defended militarily. The border between East and West Berlin, however, remains open and is now the only viable option for East Germans looking to flee. 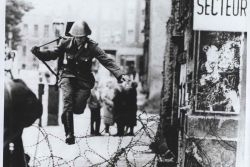 1960 Since the closing of the inner German border in 1952, some 3.5 Million East Germans representing around 20% of the population have left the country via the loophole that is West Berlin. Even more problematic is that the majority of those defecting are highly educated and skilled workers, representing a significant “brain-drain” for the GDR which, if left unchecked, would have crippled the fledgeling nation. 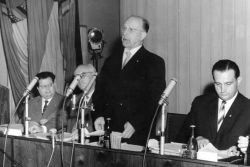 1961 12th August: GDR Leadership attends a gathering in Döllnsee, a forested area north of Berlin where Ulbricht signs the order to secure the Border. At midnight, East German police and military personnel get to work. 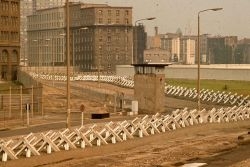 1961 13th August: Berliners awake to find a 155km (96mi) line of fences and barbed wire dividing East and West Berlin. 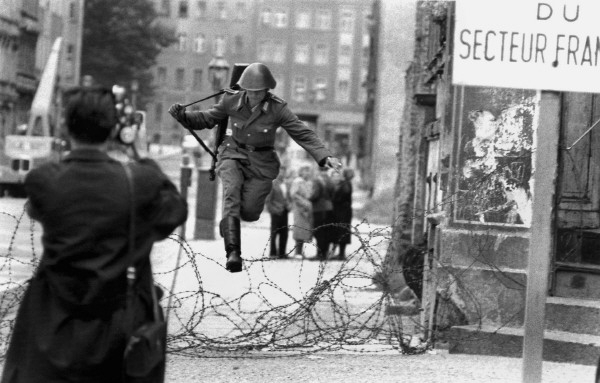 1961 15th August: East German soldier, Conrad Schumann, seizes an opportunity to escape over the border, still just a barbed wire fence. The photograph would become one of the most widespread images of the period. 1961 16th August: Just a few days after the initial barbed wire is rolled out, work commences on a brick “second generation” wall. 1961 24th August: Günter Litfin, a twenty four-year-old tailor becomes the first person to be shot and killed trying to cross the Berlin Wall. Boldened by reports of successful crossings reported on West Berlin radio he attempted to cross the Spree canal at the Humboldt harbour, not far from where the Berlin Hauptbahnhof stands today. Unfortunately, he wasn't to know that just hours before, border guards had received their first shoot-to-kill orders and after first firing a warning shot, the guard then shot and killed him, only 10 metres from the shore. 1962: Construction commences on a second fence running parallel to the first further inside East Berlin territory. Any buildings between the two are destroyed and their occupants relocated. This creates what is known as the death strip. A no man's land covered with raked sand, the death strip offered no cover and ideal sight lines for the guards defending the wall. Barbed wire, dogs, and beds of nails under the sand rounded out the defences. At the same time, the outer wall is upgraded to the third generation wall, still a brick wall of mixed materials. 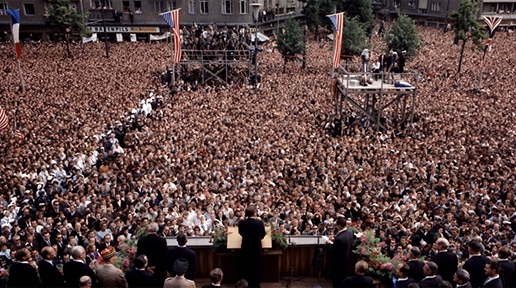 1963 26th June: US President John F. Kennedy makes his famous speech on the steps of the Schöneberg Town Hall, now the seat of the West Berlin Government. 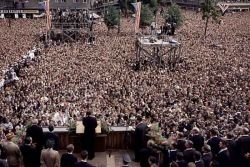 A crowd of 450,000 turned out to hear him give one of the best speeches of his career. 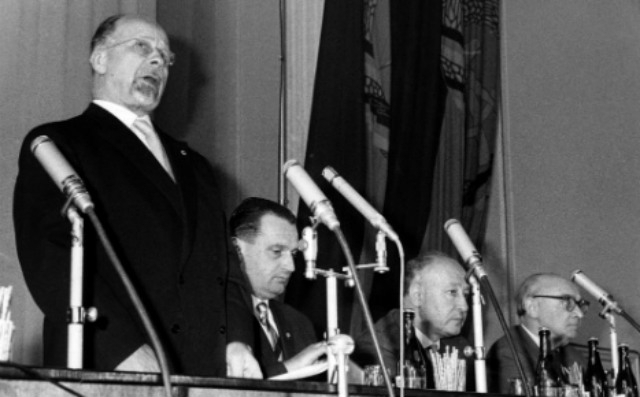 As much for the Soviets as for the West Berlin people, he declares his support for West Berlin with the immortal words… “All free men, wherever they may live, are citizens of Berlin, and therefore, as a free man, I take pride in the words "Ich bin ein Berliner!" John F. Kennedy speech. Image is in the Public Domain. 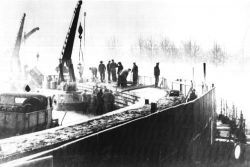 1975: At a cost of around US$3,638,000 the fourth generation wall is erected, known officially as "Stützwandelement UL 12.11" (Retaining Wall Element UL) or Grenzmauer 75 (Border Wall 75). Consisting of 45,000 separate sections of reinforced concrete with a height of 3.6m (12ft), crowned with a smooth pipe, this is the most common incarnation of the wall seen in photographs and the surviving sections of the wall in Berlin. Much research and development went into this version, with the concrete able to withstand being rammed by car. Certain sections were made weaker so as to allow tank access in the event of war with the western powers stationed in West Berlin. Image CC-BY-SA-3.0-de. 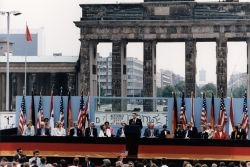 1987 12th of June, U.S. President Ronald Reagan makes his famous “Tear down this wall” speech at the Brandenburg Gate at the 750th Anniversary celebrations of Berlin. 1989 18th of August, as the Eastern Bloc begins to crumble, Hungary disables its border with Austria, allowing thousands of East Germans to use this opportunity to flee to the West. 1989 September – Protests break out all over the GDR in what has come to be known as the Peaceful Revolution. On November 4th over 500,000 people gather at Alexanderplatz to protest against the regime. 1989 9th of November. Faced with the relaxation of the borders of their neighbouring countries, the GDR decide to allow their citizens to travel freely. 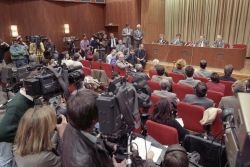 The party spokesman, Günter Schabowski, is tasked with conveying this information at a press conference despite his lack of involvement in the discussions about the new regulations. Shortly before he takes to the microphone he is handed a briefing announcing the changes, which are supposed to take effect the following day. He reads the note aloud and then when asked by a reporter when the changes are to take effect he looks at the memo and states “Das tritt nach meiner Kenntnis… ist das sofort, unverzüglich” “To my knowledge, it shall enter into force……straight away, immediately”. 1989 9th of November (cont.) 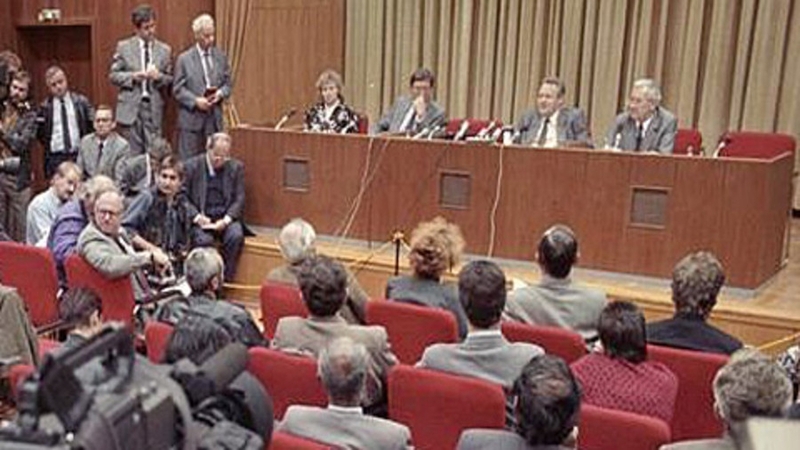 Excerpts from the press conference are played on the evening news of the two main stations in West Berlin which the majority of East Berliners also receive. 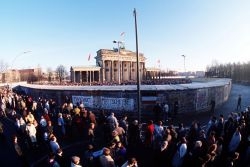 Upon hearing the broadcast, East Berliners gather in their thousands at the various checkpoints along the wall. The guards, overwhelmed by the superior numbers have no way of holding back the tide of people. At 10.45pm, the guards opened the checkpoints and the East Germans rush through to be greeted by their West German neighbours, families and friends holding flowers and champagne. The scenes of joy and jubilation are beamed around the world, heralding the end of the Cold War. 1990 105 artists create the world's largest Open Air Gallery on a section of the Berlin Wall now known as the East Side Gallery. 1990 Although several new border crossings have been opened in the previous 7 months, and many souvenir hunters (nicknamed Mauerspächte – Wall Woodpeckers) have caused significant damage creating other unofficial crossings it is on the 30th of June 1990 that the official removal of the Berlin Wall commences. Berlin Wall History is a complex topic and we hope that we have distilled it down into a digestible form. 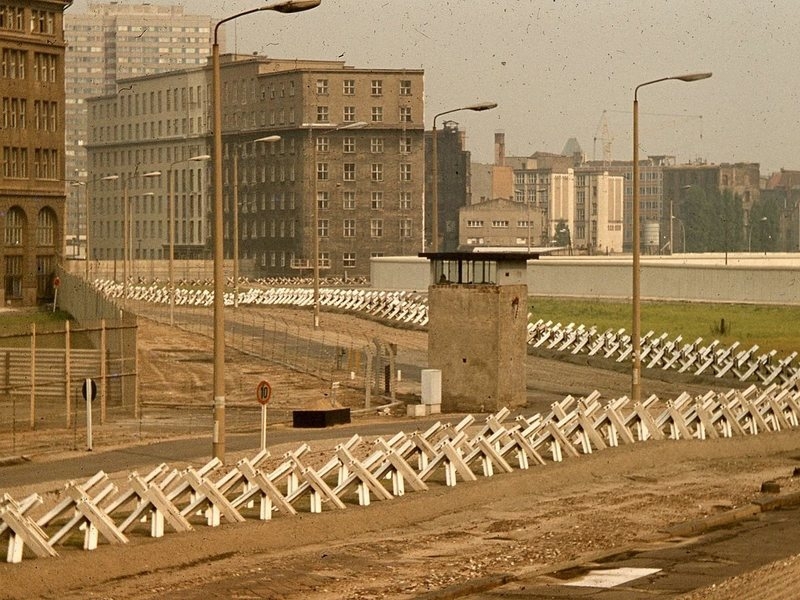 Today, the Berlin Wall has been erased from the Berlin landscape except for a few selected sites. 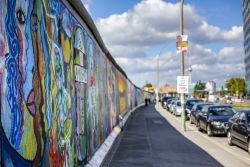 If you are looking to see the Wall for yourself have a look at the article on our Top 10 Berlin Wall Locations.